Or you can pay more at Amazon. Picking up from the Introduction to Integral Thinking I posted a while ago, it’s time to put my book into integral terms. I’ll go chapter by chapter so as to keep things manageable. The first chapter of Healing The Unhappy Caveman is called, “The Truth About Truth.” It is essentially about the relationship between UL (upper left quadrant – individual subjective) and UR (upper right quadrant – individual objective). Though I had no knowledge of integral thinking at the time I was writing the book (2002-2004), I had a sense that my message would lack real gravitas if I didn’t immediately address the relationship between objective reality and what we, as individuals, experience of it. The gist of my stance is there is theoretically such a thing as absolute truth. In integral terms, there is an objective reality (the two right quadrants) that is quite independent of what subjective minds (the two left quadrants) might think about it. (Yes, I believe a tree falling in the forest makes a sound even if no one is around.) Of course, the trouble comes when you try to do something with that reality – measure it, describe it, manipulate it, etc. At that point, subjective interpretations of that objective reality are in play. And for us, with our impressive, yet limited, abilities to truly perceive reality, the result is a mental model of our world that is both massively reliable and relative to its core. The model is reliable because the pieces fit together most of the time. Though the notion of red as a color is an artificial construct of our minds, it works well enough that we can use it to describe things that are similar in color, even if they’re different in every other way – apples and fire trucks, for example. It is relative to the extreme because everything we know (or believe we know, to be exact) is related to something else we know (or believe we know). And if you keep deconstructing things you know or believe into their component pieces, you eventually wind up in the land of the very, very, very small – the quantum world. And there…well, everything is a guess, an approximation, a probabilistic measure of absolute reality. So, I assert that a critical step in making progress toward ridding our lives of unhappiness is coming to grips with the limitations our minds impose on us when it comes to interpreting reality. Now, I’m not suggesting, not even for a moment, that we should just interpret reality however we want because we acknowledge that we can never be sure. Quite the contrary. I argue that there are two very important things to take from this realization. Though we recognize that we can never be sure, we should endeavor to get our subjective version of reality to align as closely as possible with absolute reality</li? And what exactly does all this truth talk have to do with happiness? Well, the short answer is that the more your UL perspective on reality differs from a UR perspective on reality, the more likely it is that you’ll be unhappy. I believe unhappiness generally comes from pervasive frustration – life just isn’t turning out as it was supposed to turn out. If this happens for long enough, we become unhappy. And what is the number one source of frustration? I say it is mis-set expectations. Things aren’t turning out like they were supposed to because our expectations were unrealistic (the UR kind of realistic, that is). And why would we have unrealistic expectations? Bingo! Because there’s a disparity between our UL interpretation of reality and the more concrete UR perspective of reality. In keeping with my intent to frame the enlightened caveman concept in Integral terms, it’s necessary to discuss the notion of consciousness development. Once again, it was Ken Wilber who introduced me to this highly useful codification of natural phenomena. Let me start by framing what sounds a bit esoteric in more practical terms. You can think of consciousness in this context as breadth of perspective – that is, how much of your world you consider from moment to moment. If you have a narrow perspective, you think about yourself primarily, whereas, if you have a wide perspective, you think about yourself as well as others. The most important thing is that expanding perspective (or increasing the level of consciousness) is a developmental thing, which is to say that you have to proceed from narrow breadth of perspective through ever-expanding perspectives – you can’t simply adopt a broad perspective without first having a narrow one. One approach to describing this is to say that people develop from egocentric (focused exclusively on the self) to ethnocentric (self plus in-group, which can be family, community, church, nation, etc.) to world-centric (self plus in-group plus everyone and everything else). We can easily see this with children. Infants and toddlers have very narrow perspectives – they are focused on their needs exclusively. They are egocentric. Indeed, for the first couple of years, they can’t even identify themselves as distinct entities within the world. As they get older, children expand their perspectives to include their family members – they become aware that the people around them also have thoughts and needs. Then, as they get older still, they continue to expand their perspectives to include larger and larger groups – kids at school, people at church, and so on. Eventually, they may come to include their nation in their perspective (especially in nationalistic countries). All of this still falls under the heading of ethnocentric. But then, in some cases (more on that in a moment), development continues and the perspective comes to include people (and things) that are beyond any sort of ethnic connections – the people of the world, and even the planet itself. Now, this notion of development of consciousness brings with it an implication – that higher levels of development are better than lower levels. Yikes! That sounds a lot like a hierarchy, and the sensitive among us abhor hierarchies because the entities at the lower end of any hierarchy almost always fare worse than those at the top, right? That’s one perspective. I’m not ready to throw out hierarchies – they’re critically useful in many, many ways – but there is a cautionary note in all of this. According to supporters, applications of this model allow the experienced user to analyze both micro- and macro- systems of human and cultural behavior. Dr. Christopher C. Cowan and especially Don E. Beck committed several years to applying the theory of Spiral Dynamics in an extended experience in South Africa to bring an end to Apartheid. The racial tension was so severe that in order to avoid a simplification of the deep-rooted cultural tensions into merely ‘black and white’ issues, Dr. Christopher C. Cowan developed a color scheme to aid in his communication of the theory. The colors act as reminders for the Life Conditions and Mind Capacities of each system and alternate between cool and warm colors as a part of the model. Within the model, individuals and cultures do not fall clearly in any single category (color). Each person/culture embodies a mixture of the value patterns, with varying degrees of intensity in each. Philosopher Ken Wilber used the term ‘Holon’ to describe the state of not only representing the highest level of emergence obtained, but simultaneously inhabiting (at least a part of) each of the previous levels as well. Wilber references the notion of ‘transcend but include’ when speaking of the process of advancing to higher levels of development. You can think of the colors as representing what people in each level seek out in life as the levels grow out of those which came before. * Yellow. Independence/self-worth; fitting a living system; knowing; good questions. * Turquoise. Global community/life force; survival of life on Earth; consciousness. Now, you should be able to pretty easily see how these levels relate to people and cultures you know. Tribal cultures, such as the Taliban, are very “Red”, while Victorian England, for example, is a great example of “Blue.” The modern US is mostly “Blue” and “Orange” with a substantial minority of “Green.” Keep in mind that the same concept of development – specifically, that you must pass through lower levels to get to higher levels – still holds here. Indeed, if you look at human history, or at the history of a single human, you can see the progression. And what of multiple tiers? As I mentioned earlier, this concept really gets interesting when you introduce tiers into it. Graves, Beck, and Cowan divide the aforementioned list into two tiers. First tier includes all levels up to and including “Green.” Second tier includes “Yellow” and “Turquoise.”. There is also a third tier, but I haven’t wrapped my head around it yet, so I won’t trouble you with any more on that. Suffice it to say that third tier ventures into spirituality in a big way. Anyhow, the defining characteristic of first tier is that individuals at these levels tend to think of their way of thinking (or perspective, if you will) as the only correct one, and they think that those who think differently are deeply confused (and even evil, in some cases). Second tier, on the other hand, embraces the notion that each level has its value and that individuals at any given level are not to be blamed for their perspective. 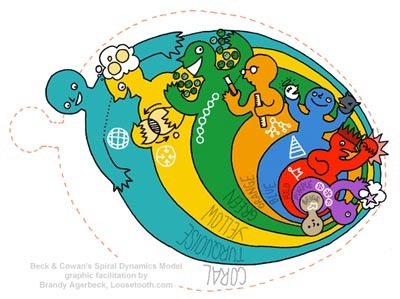 More importantly, second tier places importance on nurturing the entire developmental spiral (which gets its name from the notion of an expanding spiral of development – as in the image above). That means allowing people and cultures to be where they are while facilitating their growth to higher levels – one level at a time. Again, it’s about recognizing that we get good and bad things from all levels. Though the “Red” level accounts for a great deal of human suffering thoughout history – what with the focus being on power and wielding it, even if that means the wholesale slaughter of one’s enemies – there is certainly value in nurturing relationships with inner circle people and with unflinching loyalty. Same with “Blue” – while being overly attuned to “the rules” can literally erase notions of individuality, there’s no doubting that law and order came about as a result of going from “Red” to “Blue” consciousness, and that, perhaps more than anything, has allowed our species to organize and advance in spectacular ways. The point is that every successive level “transcends and includes” the lower levels. Hopefully, you minimize the negative aspects while accentuating the positive ones, but one thing is for sure – you don’t simply get to “Green” and shrug off all that has come before. But…”Green” being the height of first tier, this truth is very often lost on those who get there. Anyway, there you have it – a perhaps new way to think about human perspectives and how they develop. It’s amazingly useful on so many fronts, but in the context of The Enlightened Caveman concept, it has a particular value. In short, the ethics that are derived from understanding our evolutionary history, our minds, and how they work in this modern world are all second-tier ethics. Just the act of stepping back and thinking about how we think places us on the path to second tier. And when we realize how our inherent focus on status and reciprocity colors our perceptions of and reactions to other people, we can begin to get some sense of how much perspective really matters – both ours and that of the people with whom we interact.